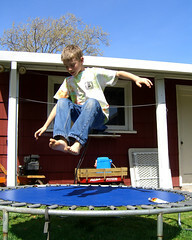 How do you offer physical education & after school sports to your homeschoolers? Physical education is a requirement in school, but when you homeschool your children you don’t have a gym readily available. 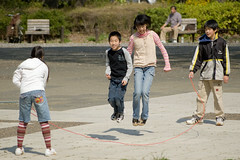 So how do you offer physical education and after school sports to your children? Here are a couple of things you can try. One way to offer physical education to your children is to call the Boys and Girls Club in your area and see if they offer their gym to homeschoolers. If they don’t, see if they would allow you to set up a time two or three times a week and get all the homeschoolers to join you on those days. If you don’t have a Boys and Girls Club, check with any other organization that offers support to children. Another option for physical education is to teach it yourself. You can take your children to the ice arena, roller rink, and swimming pool and teach them yourself. You can also go on a hike, take the kids to the park and teach them to play basketball, or you can take them to the soccer fields and teach them to play soccer. It could even be as simple as going for a daily walk with the kids. You could also include them in your own exercise routine. Many children love doing exercise videos, and of course they enjoy spending time with you. You can also talk to a school in your area and ask them if your children can participate in one of their physical education classes. You need to talk to the principal of the school to see if this would be possible. Some public schools are welcoming to homeschoolers, and some are hostile. Be prepared for all kinds of reactions to your query. You may want to talk to other homeschooling parents to see if they would be interested and take that to the principal. Another option you might consider is to talk to a few of the churches or private schools in your community. They may consider offering a class specifically for homeschoolers or they may consider allowing you to bring your children and participate in their classes. Look at the curriculum that you are following to see what options you have available. Dance class, karate, kick boxing, and other classes that are offered at the recreation center may qualify as part of your physical education classes. The classes offered through your city’s recreation department are often more reasonably priced than private lessons. You may be able to combine courses and cover a couple of classes at once. An example of this is go on a hike and look at rocks, trees, plants and flowers. This will cover both your physical education and science classes. Another thing that your children may miss out on because they are not in a school setting is the sporting activities such as football, basketball, or track. To make this possible you will want to check with a local elementary, junior high or high school and see if they would allow your children to play. For elementary aged students you can check with the Boys and Girls Club, recreation center or YMCA to see if they offer any type of sporting programs. Most of these organizations offer sporting events for children in K-6 grades. Just because you homeschool your children doesn’t mean they have to miss out on physical education and after school sports. There are many options for you to consider.